For the third year in a row, the masters section of one of our signature events of the year boasted an average rating greater than 2430! The class championships had 36 participants, of which ten were experts. 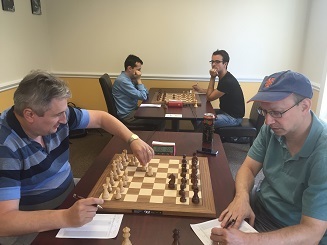 Grandmasters Aleksandr Lenderman and Romain Edouard tied for first in the masters section with 4/5 points and earning $400 each. Sam Barsky was the sole winner in the class section, winning $400 for his efforts. There were many upsets beginning from round one. CCFC instructor Robert Steindorf got off to a blistering start in the class section, beating two experts (both nearly 400 points higher rated) in the first two rounds. Kaushal Kalyanasundaram rated 1530 had a great tournament, with a performance good enough for him to win the top U2000 prize! Meanwhile, the hero of the masters section was FM Leif Pressman who finished with 3.5/5 to tie for third place. 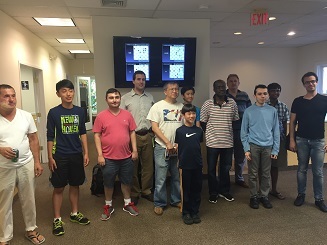 He defeated GM Michael Rohde and drew GM Aleksandr Lenderman along the way. Below are a collection of top games from the masters section. National Master Daniel Lowinger has selected and annotated some of the more exciting encounters!